Sources of dietary fiber are best in their natural plant state. You need to know the sources of dietary fiber so that you can effectively incorporate fiber into your meal planning. With enough fiber in your diet, food will pass quickly and easily through the digestive system. The broom-like effect of enough fiber will aid in the absorption of nutrients into the blood stream and assist in elimination of toxins. There are two types of dietary fiber. Both are forms of indigestible complex carbohydrates. 1. Soluble Fiber. This type of fiber is found in peas, oats, citrus, carrots, barley, all kinds of beans, and in psyllium. It forms a gel like substance when dissolved in water and can assist in lowering cholesterol and glucose levels. 2. Insoluble Fiber. The main function of insoluble fiber is to move bulk through the digestive system and help in maintaining the proper pH balance in the system. This fiber does not dissolve and is found in almost all UNPROCESSED vegetables, fruits, grains, seeds and nuts. We know that it's always best and more delectable to eat fiber in its natural plant state. Some people have a continual problem with digestion or need help with supplements to ease constipation and soften the stool. There are many brands (Metamucil, Yerba Prima, Benefiber) with special fiber formulas that are good sources of dietary fiber. Hopefully, using fiber supplements will only be a temporary thing until you incorporate the fiber in your everyday meals. Using fiber supplements should not be a substitute for high fiber foods for individuals without digestive problems. If you take supplementary fiber make sure that you drink plenty of water or other fluids each day. Failure to use sufficient water may make constipation or other problems worse and you will not get the full benefit of the additional fiber. 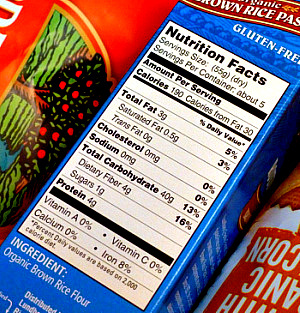 If you have to use processed foods in a box or can, look on the nutritional label. Among all the good or disappointing information on the label you can find the amount of fiber in one serving. Pay particular attention to the serving size. This is what all the information is based on. If you are looking at bread or other baked items, remember that the words "whole grain" should appear to give you the most fiber and the most nutrients. When you take time to read the nutrition labels, you will be able to identify good sources of dietary fiber and be able to eliminate brands that have insufficient fiber. It's good to aim for 3-5 grams of fiber per serving. Remember, you don't have to search out animal products because they have NO fiber. Try to get at least 4 grams of fiber in your breakfast meal. when you are making a hot cereal, add small amounts of wheat bran or flax seed meal to increase fiber. Cut up raw veggies and fruit to snack on in place of processed foods. Use whole grain cereals with brown rice and any grain that has not been processed to remove the outer bran. These are loaded with fiber. Use the same whole grains when selecting pastas, breads, pizzas, pancakes and muffins. When you make a salad, soup or stew, incorporate beans such as pinto, black, kidney, etc. Eat whole fruit instead of pasteurized fruit juices. There is considerably more fiber and other nutrients in the whole fruit and you get a bonus of active enzymes. Eat the skin with the baked potato. Eat more broccoli - it's very high in fiber, phytonutrients, minerals, and vitamins. Skins of fruit are a good source of dietary fiber. Try to incorporate 3 servings of whole grains and a minimum of 6 servings of fruits and vegetables each day. This will probably furnish the fiber you need. 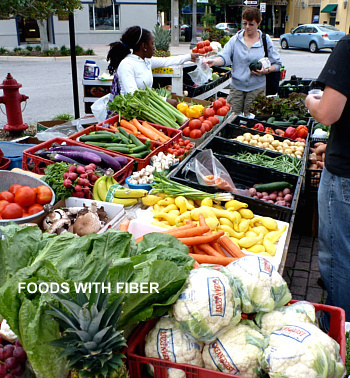 High Fiber Food - Become aware of the foods that will keep your system functioning at the highest level. High Fiber Cookies - Homemade cookies are a great way to up your daily fiber intake.